Everybody likes Italian food. Is it pasta or pizza or both? I like pizza, but I love pasta. I am a big fan of the creamy Alfredo sauce and the creamy tomato sauce. But marinara sauce.... not my favorite. I even order my pizza minus the sauce. Anyways, lets come to today's pasta. 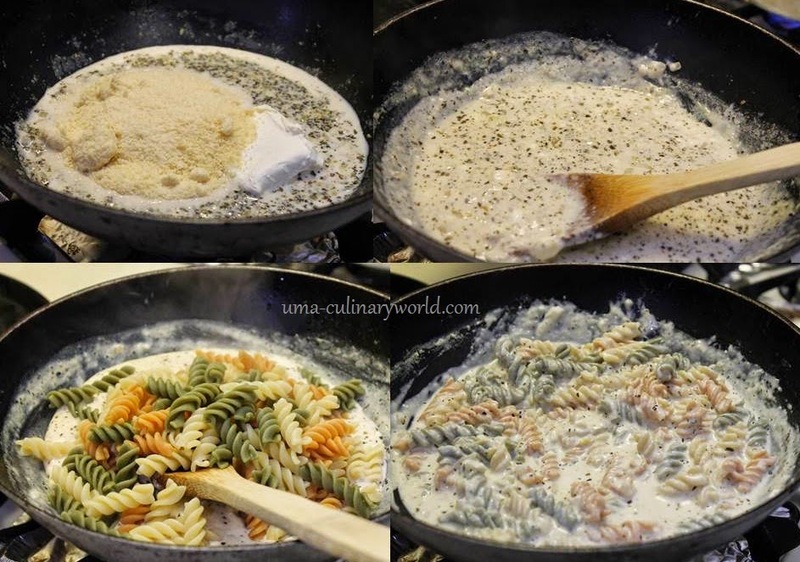 This white sauce with cream cheese is my go to recipe for our Tuesday pasta dinners. Add about 8 cups of water to a big pot. Add a generous amount of salt so that water turns salty. When water starts boiling, add 1 tbsp oil and any pasta of your choice. I used vegetable rotini pasta. Cook it for 9 - 10 minutes, stirring it occasionally. Oil will not let the pasta turn mushy or sticky. Or cook the pasta as per the package instructions. While pasta gets cooked, start preparing the sauce. Finely chop onions and garlic. Heat 1 tbsp oil in a pan. You can use unsalted butter as well. Add onions and garlic. Saute until onions soften. Now add oregano, basil and fresh ground black pepper. Saute at low heat for about a minute. Fresh basil will definitely taste better. Now pour milk to the pan. When milk starts boiling, add cream cheese and Parmesan cheese. 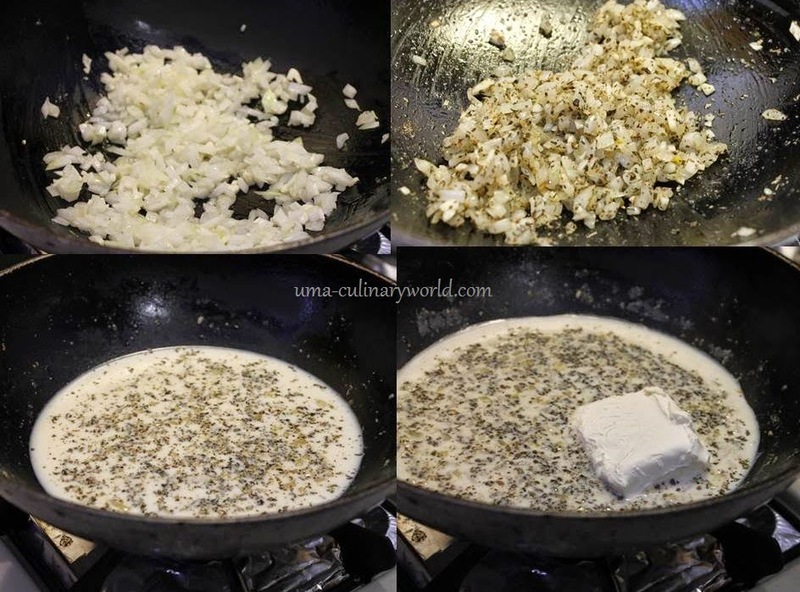 Stir until both cheeses melt and sauce turns creamy. Add salt just enough for the sauce. Your Cream Cheese Alfredo sauce is ready. Add the cooked pasta to a strainer. Save about 1 cup of the pasta cooking water. Lastly, add the hot drained pasta and 1/4 cup pasta cooking water. If you feel the sauce is too thick, add little more water. Toss well to coat the pasta well and turn off the heat. Garnish with some fresh basil and Parmesan cheese. Sometimes, I use 1.5 cups of small shell pasta and 1/2 cup vegetables like frozen green peas and it tastes good too. Use any other veggies of your choice. I added the green peas after both the cheeses melt and cooked it for just one minute, before adding the hot pasta. Delicious and lovely looking preparation. Wonderful looking pasta.